Like pens and words are mightier than swords and missiles at times, books are far more blinding and binding when it comes to subjugation of humans under the guise of religious isms. Almost all the major isms in the world have a central book and its followers are tied down at all levels with the good and bad messages emanating from the single book. Most times the original author (actually a team of authors) is clever enough to assign a divine presence behind the book and its instructions, thus making it infallible, uneditable and even worthy of worship. Any book contains knowledge related to its times and frozen knowledge is nothing but stale, stagnant and senseless. Followers of such blinding books can create only havoc when they confront seekers of true knowledge which can be realized only with open minds. For sure all future wars will be for freedom from such books, if not for drinking water and fresh air. In broad terms, knowledge can be classified into two categories - occult and open. The essential difference between the two lies in its openness to debate. Occult knowledge is secretive, frozen, known only to its proponents and invariably with hidden agenda. And open knowledge is free, progressive and open to debate and change. Books containing occult or open knowledge are one of the best ways to influence the literate humans. It is this interesting aspect of books that is being effectively utilized by clever religious leaders for enhancing their own ambitions. All successful religious leaders have put in place their own versions of incoherent and incomprehensible texts as words from God in a well planned manner. Most of such religious books contain occult knowledge which is of little or no use for existence and evolution of mankind. One of the essential objectives of occult knowledge is its dire need to enforce uniformity among its followers. Uniformity is a wonderful attribute when it is present among a group of people with the same objective. This is more so if the common objective is conquering or destroying something by force or by deceptive means. Enforcing uniformed exteriors is only one aspect of achieving uniformity in a group of people. The more difficult part is attaining uniformity in values, thought and action. The only way to capture the minds of humans is through sustained indoctrination by means of injecting occult knowledge. Compiling book(s) containing desires of the leader, preferably in a style that is more symbolic and seldom descriptive, and assigning divinity to them is a proven method to attempt uniformity among followers. And if the initial few generations of questioners and dissenters are suppressed with an iron hand, the success of such books is assured. Many of the central books containing occult knowledge are best examples of such a “uninforming” process. There are many more proven recipes for ensuring the success of such central books containing occult knowledge. Selection of its language, topics and narrative methods are the most important. A tone of infallibility must be present throughout the text. Hatred for those who doubt the book and assault on any competing ideologies can enhance its chances of success much more. Scope for deceptive interpretation must also be amply provided for development of successive generations of interpreters. And after a few hundred years, the sheer population of those making a living by interpretation of the book will ensure its sustenance at any cost. Different schools of interpretation will emerge but the centrality of the book of obnoxious occult knowledge and its author shall remain unchallenged. The process will continue to vitiate humanity until another set of much more wicked leaders emerge to pen down their own books of occult knowledge. In sharp contrast, the books with open knowledge open a much more refreshing window for anyone in search of freedom and absolute truth. Indians can be truly proud of their civilization that has propounded Sanatana Dharma which contains some of the best examples in this regard. For the ancient Indians, knowledge was equally important as air and water. 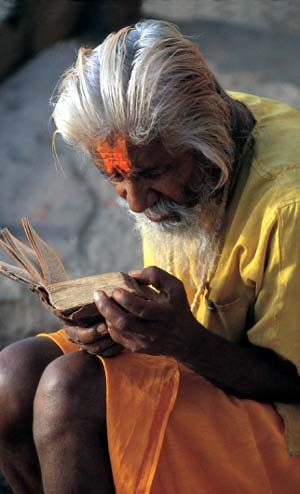 The innumerable books produced by Indian Rishis contain knowledge that is open in every sense. It is open to questions, debate and changes if needed. Quite unlike other religious civilizations, there is no single central book in the Dharma. How can one believe in the theories of the omnipresent and omnipotent God speaking to prophets who are all from only a particular region in the world and speaking only a particular man-made language? If it is true, then it must be a limited God who knows only that part of the world and its language. Books containing open knowledge are known for their logic and coherence. Sanatana Dharma does not prescribe any books that contain the authentic and unchangeable words of God. Even the four Vedas that are available now represent only collective bodies of knowledge in specific areas. The openness of Sanatana Dharma is best represented in a stanza in one of its most outstanding books viz. Bhagavad-Gita. Chapter-18, Sloka-63 - iti te jnânam âkhyâtam, guhyâd guhyataram mayâ, vimrsyaitad asesena, yathecchasi tathâ kuru (Thus, I have instructed you in knowledge which is more confidential than the secret knowledge of brahma. Reflect on this knowledge properly, and then act as you wish). The ‘act as you wish’ command is proof enough of its openness. People’s literacy is increasing tremendously in all parts of the world. But a large section is getting literate only in occult knowledge and not in open knowledge. Most of our problems emanates from this single issue. Even completely indoctrinated people with exposure to only occult knowledge want to raise questions when they accidentally breathe the fresh air of open knowledge. But the mortal fear instilled by their leaders silences such a minority for ever. The captive majority in these communities, however, continue to wreck havoc in the world armed with ignorance as their deadliest weapon. They do not see or read any book that tells them that knowledge can never remain frozen in time. It is only values (Dharma) that remain with no beginning and no end (Sanatana) in our world.